If you love your mobile slots games on the classic side, then this creation from Mr Spin Casino will get your mouth watering. Reel Fruity Slots Mini is a small but mighty online slots exclusive that’s fast become the apple of our eye. Mr Spin’s original fruit machine game, Reel Fruity Slots Mini is a 3-reel, 5 win line game with classic fruit symbols, the juicy progressive Mega Jackpot and a grape Gamble feature that could see you multiplying your wins. Isn’t it time you got one of your five a day? Reel Fruity Slots Mini is compatible with devices running iOS 10 or Android 5 and above. Ready to pop your cherry and get started with Reel Fruity Slots Mini? Tap “Play For Real” to launch the real-money version of the game. Want to practice first? Select “Demo” to try the game before you play for real. Reel Fruity Slots Mini is a 3-reel slots game, locked to 5 win lines so the only thing you need to set is your bet per line. You can bet anything from 4p a line up to a maximum of £20 a line across all 5 win lines. Tap ‘Bet’ to set this. Your total bet is your bet-per-line multiplied by the number of win lines in play; betting £1 a line for instance will give you a total bet of £5. This amount is displayed in the ‘Total Bet’ box and is your cost-per-spin. Once you’re happy with your total bet, tap the rotating spin arrow and the fruity symbols will roll in on the reels before stopping at random. You can automate this process with the ‘Auto Spin’ feature. Tap ‘Bet’ and select ‘Auto Spin’ to bring up the menu. From here, select a number of spins, a credit limit, and a maximum win amount. Tap the arrow when you’re happy, and Reel Fruity Slots Mini will play through that number of spins automatically. These auto spins will stop when you run out of spins, hit your credit limit, or spin in a win that exceeds your maximum win amount. You can also revert to manual play at any time by pressing ‘Stop’. The game also has a MAX BET Feature, this takes your current credit amount and uses it to create the highest valued bet possible. It will place your remaining credit into the largest possible bet. The option has a warning pop-up that you must choose to dismiss; this pop-up resets with every new play. Once you’ve had a practice play in Demo mode and understand the rules, it’s time to play Reel Fruity Slots Mini for real and see if you can spin in some bananas wins. Choose your bet-per-line, decide whether you want to play using manual spins or the Auto Spins, and tap the white, floating arrow to spin the reels. The traditional fruity symbols will burst into life, spin in, and come to a stop at random. Much like the traditional one-armed-bandits Mr Spin based this game on, the win lines in Reel Fruity Slots Mini pay from left to right. And should you spin in a win on these fruity reels, your prize will be highlighted on screen before automatically being added to your total credit. Exactly what constitutes as a winning combination will depend on the symbols. You’ll need to line up 2 or more of some, whereas you’ll need to spin in 3 of others. For full details, tap the three horizontal lines in the top left and select ‘Paytable’. You could spin in a fruity fortune in this Mr Spin exclusive mobile slots game. Just like the traditional one-armed-bandits Reel Fruity Slots mini is based on, if you spin in a winning combination of symbols you’ll win a multiplier of your original bet-per-line. As well as matching fruits to grab a win, you could also spin in a reel win by mixing sevens of different colours. Check out the ‘Paytable’ for more information. If you’re berry lucky and you spin in a winning combination on more than one win line, Mr Spin will add them together before automatically adding your prize to your total. If you happen to spin in multiple wins on a single win line, only the highest win-per-line will count. You could squeeze a little extra out of your spins if you happen to spot the silver Wild symbol on the Reel Fruity Slots Mini reels. Anywhere else, silver would get you second place. But in this Mr Spin game, it could be your ticket to a solid gold win. That’s because Wild symbols substitute for almost all the other in-game symbols – except for the Free Spins symbol – to potentially turn a losing spin into a winning one. Say you line up two watermelon symbols and a Wild. The Wild will act as a watermelon, and you’ll receive the multiplier for 3 x watermelon symbols. We hope this part won’t leave a sour taste in your mouth, but we need to tell you that you can’t win the Mega Jackpot where a Wild lines up alongside a Jackpot symbol. The only way you can bag the top prize is spinning in three gold 7s on a single win line. You’ll get the chance to gamble any of your on-reel wins under £1000 when playing Reel Fruity Slots mini. When you spin in a win, the Gamble wheel will pop up on screen. Tap ‘Gamble’ if you want to try and boost your win. In the Gamble feature, you’ll find a wheel with varying multiplier amounts around. Select your multiplier and press the floating arrow to spin the wheel. If the wheel lands on the green segment, your original win will be multiplied by this amount. If it lands on red section though, you lose your original win and return to the reels empty handed. You can change your mind right up until you press the arrow and return to the main game by pressing ‘Collect’. Mr Spin is a pretty generous guy, so keep an eye out for the gold Free Spins symbol. Spin in 3 of these on any active win line to grab 5 free spins. These will lock to your last bet amount, and do more than give you free spins. Spinning in 3 free spins symbols will also activate the Win Ladder. In this feature, you’ll climb a step up the ladder for every consecutive win you spin in during your free spins. Those wins will be multiplied by the step you’re on. If you don’t spin in a win, the ladder resets to x1. If you win while on the top step, you’ll remain there for the next spin. The Win Ladder will become inactive again when your free spins run out. Grab a bite of Reel Fruity Slots Mini today, and sink your teeth into this modern take on the traditional fruit machine. Not got an account with Mr Spin yet? Sign up today, and grab up to 50 FREE SPINS* as a no deposit bonus! If you decide to play on and make a deposit, we’ll also match your first deposit 100% up to £100! * Play today! During any spin there is a chance that the Progressive Mega Jackpot can be triggered by achieving 3 (THREE) Jackpot symbols on an active win line. 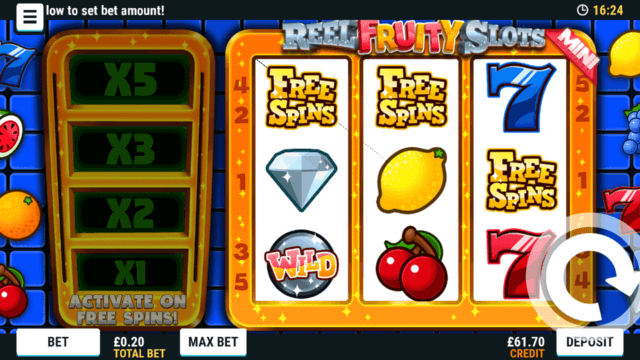 Reel Fruity Slots Mini online slots has a theoretical return to player of 94.8%. This is based on long term playback. System malfunctions void all payments. Monies are staked in the following order: winnings, player deposits, bonus credit.